The long waiting period has pushed the company to ramp up production from 2,500 units per month to 4,000-5,000 units per month. 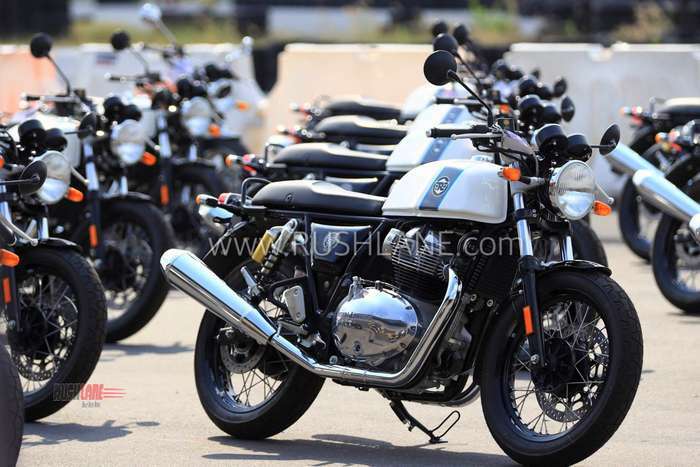 Royal Enfield 650 twins were launched in Nov 2018. Both these bikes have been seeing outstanding demand to the extent that it is difficult for production to keep up, causing an extended waiting period. Waiting period as on date extends to 4-6 months across the country, which is among the longest waiting period for any production bike in India. It was also noted that waiting period for both these bikes is the same, despite the fact that demand for the Interceptor 650 far exceeds that of the Continental GT 650. Delivery periods also vary with dealers in Mumbai and Chennai claiming a waiting period of 4-5 months while dealers in Mysore state a waiting period of 3-4 months. The long waiting period could be attributed to high demand within the country and globally. It has also been compounded by a strike called by workers at the Royal Enfield Oragadam plant again in February, three months after the strike was originally called off, over lack of progress in negotiations. To ensure lower waiting period, the company now has ramped up production to 4,000-5,000 units from current 2,500 units. This will help in bringing down waiting periods substantially. In terms of sale, Royal Enfield Interceptor and Continental GT 650 have been noting a steady rise in demand ever since launch in November 2018. Sales in November stood at 325 units which went up to 629 units in December 2018 while sales in January stood at 1,069 units. In February, sales of the RE 650 Twins escalated to 1,445 units and outsold every other middleweight bike by a huge margin. The 650 Twins are also exported to markets such as UK, USA, Thailand and Australia. Bookings in Thailand have exceeded over 700 units for both the model and plans are afoot to open the first overseas CKD plant in Thailand from later this year. Royal Enfield Interceptor and Continental GT 650 are not only the best RE motorcycles till date, but are also aggressively priced at Rs.2.50 lakhs and Rs.2.65 lakhs respectively. The bikes are powered by a new 648cc, parallel twin, air cooled engine offering 47 bhp of maximum power at 7,250 rpm and 52 Nm of peak torque at 5,250 rpm.